Zbierz kolekcję figurek i weź udział w przygodach w świecie World of Warcraft. Zapraszamy na stronę producenta gdzie dowiesz się więcej o nowej grze bitewnej. - Lista figurek ze starterów. 4 Exclusive, Premium, Pre-Painted Figures 4 Character cards 8 Action - Bar Cards to customize your characters! 6 Faction-themed, 10-sided dice 4 Detachable UBase Miniature bases to track stats 1 Double-singed game map 1 Core Set Miniatures checklist The official street date for the Starter and Booster is set to 18th November 2008. 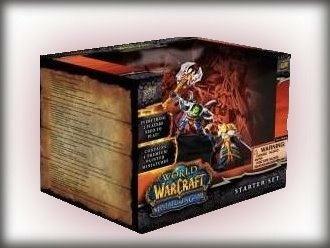 The Deluxe Starter edition will be released on 9th December 2008.